I'm not particularly religious but I'm a little uneasy about the sad demises of horses being announced on the R.I.P thread. I suppose this is the best place to put horse news when a good one passes. that Rough Habit had been euthanased in NZ. He had poor sight from only one eye, and increasingly having hoof problems. but twice then won the Doomben Cup a third time. Wales and his native New Zealand. A public memorial service for Thoroughbred champion Cigar will be held at the Kentucky Horse Park tomorrow, Nov. 14, 2014, at 2 p.m. He was completely riddled that horse. Could not get it up at all in the breeding barn. The Lance Armstrong of thoroughbreds. Clare Manning, daughter of Trading Leather's jockey Kevin Manning, reported that the Irish Derby winner was euthanized. Doriemus, one of just 11 horses to complete the Caulfield-Melbourne Cups double in the same year, has died aged 24. The horse was euthanised at Melbourne's Living Legends retirement farm after suffering a hoof injury. He was raced by a group which included Terry Henderson who is now in partnership with Simon O'Donnell in OTI Racing which announced his death on Twitter. "Very saddened by death of Doriemus as result of hoof injury. An exceptional horse who gave many enjoyment while racing and in retirement," OTI said. "At 24 Doriemus had a wonderful life in retirement thanks to Living Legends, Wingara Farm and Werribee Vet Hosp - all for their great care." Doriemus won two of his first three starts in New Zealand for Jim Gibbs and was sent to Lee Freedman in 1994, winning his first Australian start for his new trainer that year in Brisbane. As a four-year-old he won just two races but came into his own the following season to claim the 1995 Cups double. 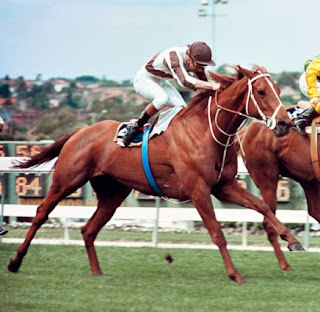 He was unplaced in both races the following year and suffered a bleeding attack in the Australian Cup in March 1997. He bounced back in the spring to finish a distant second to Might And Power in the Caulfield Cup before running the big horse to a nose in the Melbourne Cup. Ironically the pair later shared a paddock at Living Legends. Doriemus was retired after he was unplaced in the 1998 Melbourne Cup with a record of nine wins and 12 placings from 44 starts and prize money of almost $3.6 million. RAILWAY Stakes winner Elite Belle on Wednesday had her name added to a sad list of casualties within the Australian racing industry this week. Elite Belle died after suffering a heart attack on a flight from Perth to Melbourne on Wednesday morning. She followed the deaths of Australian Cup winner Super Cool, Stradbroke hero St Basil and Caulfield-Melbourne Cups winner Doriemus this week. Laming Racing reported 17-year-old St Basil “died peacefully” in his paddock at Jacobs Well, south of Brisbane, on Tuesday night. “We will never forget what he did for us,” the Laming Racing Twitter account read. Doriemus had spent much time at Living Legends alongside numerous other Melbourne Cup winners during his retirement, before a paddock accident that led to a hoof injury claimed his life at the age of 24 on Sunday. Doriemus was the third of Lee Freedman’s five Melbourne Cup winners, scoring in 1995 and almost winning the race a second time in 1997, when he was nosed out in a deceptive finish by Might And Power. Super Cool, one of a select group of three-year-olds to win the Australian Cup, died after complications to an infection in his leg. Trained by Mark Kavanagh, Super Cool is best remembered for his tremendous duels with Fiveandahalfstar. The five-year-old raced 19 times for four wins and more than $1.5 million in prizemoney. Super Cool last raced in the spring where he finished down the track in the Turnbull Stakes. Six-year-old mare Elite Belle won the Group 1 Railway Stakes (1600m) and the Group 2 Cox Stakes (2100m) during the recent Perth carnival. Elite Belle’s campaign in the east was believed to culminate with an appearance at The Championships in Sydney. She raced 25 times for 10 wins and prizemoney of more than $1.4 million. St Basil’s respectable record also included placings in Queenland’s 2004 Stradbroke Handicap and Hollindale Cup. The mighty grey amassed $1.1 million in prizemoney. I still think he'd be a chance in Sydney in the Autumn. Even accounting for being deceased, he'd be dropping a fair bit in class which would offset that. but its frowned upon North of the border! Did not realise HAY LIST had been put down on Tuesday 3rd February. Sad ending to such a great horse. We saw the best of him in his gallant placings to the great Black Caviar. In my view they were equals in spirit and in heart. Both champions because of their will to win. From 28 career starts he won 15 races for $2.55 mil. WON of 12 ELLS 23Feb85 1200m Firm ECLIPSE STAKES 2YO G3 $11,531 ($7,207) G M Stewart 53.5kg 1:10.03 Star Board 2nd Princess Carbine 3rd. WON of 14 OTAK 27Nov85 1600m Firm BAYER CLASSIC Group 2 $70,831 ($47,999) Jim Cassidy 55.5kg 1:36.90 French Polish 2nd Seadreamer 3rd. WON of 16 AVON 14Dec85 2000m Firm AVONDALE GUINEAS Group 2 $25,946 ($16,216) G M Stewart 55.5kg 2:03.05 Hot Ice 2nd Flight Bijou 3rd. WON of 15 ELLS 26Dec85 2400m Firm NZ DERBY Group 1 $115,314 ($72,071) G M Stewart 55.5kg 2:29.47 Flight Bijou 2nd Random Chance 3rd. WON of 14 TE R 11Feb86 2000m Firm CAMBRIDGE STUD INTERNATIONAL Group 2 $38,882 ($24,760) G M Stewart 52kg (cd 52.5kg) 1:59.59 Eva Grace 2nd Coronal 3rd. WON of 9 ELLS 22Feb86 2000m Firm AIR NZ STAKES Group 1 $102,707 ($64,192) G M Stewart 52kg 2:02.21 Abit Leica 2nd Lacka Reason 3rd. WON of 16 RHIL 22Mar86 2400m Good3 TANCRED STAKES Group 1 $501,250 ($311,250) G Stewart 52kg 2:31.10 5-2 Rant and Rave 2nd Abit Leica 3rd. 2nd of 13 WGUI 06Sep86 1600m Soft TIM ROGERS STAKES WFA STKS Group 3 $25,677 ($5,135) G M Stewart 57kg Bourbon Boy 1st Great Estate 3rd. WON of 13 CAUL 25Sep86 2000m Good3 UNDERWOOD STAKES Group 1 $100,000 ($65,000) G Stewart 57kg 2:01.10 6-4 At Talaq 2nd Black Knight 3rd. WON of 6 CAUL 11Oct86 2000m Good3 CAULFIELD STAKES Group 1 $100,000 ($65,000) G Stewart 57kg 2:00.60 1-4 Black Knight 2nd Tristram's Belle 3rd. WON of 10 FLEM 09Mar87 2000m Firm2 AUSTRALIAN CUP Group 1 $251,000 ($163,500) G Stewart 57kg 2:05.60 4-9 At Talaq was 2nd and Ima Red Man 3rd. WON of 12 WTUI 13Feb88 1600m Firm WHITE ROBE LODGE HCP Group 3 $27,450 ($17,385) G M Stewart 57.5kg 1:36.80 Robinski 2nd Slick Million 3rd. WON of 13 ELLS 27Feb88 2000m Firm AIR NZ STAKES Group 1 $182,999 ($114,375) G M Stewart 58kg 2nd Horlicks (NZ) 55.5kg 2:02.51 Horlicks 2nd Sounds Like Fun 3rd. WON of 8 TARA 01Oct88 2000m Heavy FISHER & PAYKEL WFA STKS $45,750 ($28,594) G M Stewart 59kg 2:13.60 The Filbert 2nd Classic Bay 3rd. 3rd of 18 TREN 28Jan89 1600m Good JARDEN MILE HCP Group 1 $74,047 ($7,405) P G Timms 58kg Tricavaboy 1st Sirstaci 2nd. 3rd of 12 ELLS 01Apr89 2000m Good TV NZ STAKES WFA Group 1 $148,093 ($14,809) G M Stewart 58kg Trissaring 1st Sirstaci 2nd. 3rd of 12 TE A 09Dec89 1600m Firm STAR WAY STAKES Group 3 $33,321 ($481) G M Stewart 58kg Krona 1st Regal City 2nd. What happened to them Aussies? 2yo racing did not harm Bonecrusher. His record beyond a mile at WFA has probably rarely been bettered. Jack - a positive comment! From the stewards report for Race 5 at Rosehill. added that the mare travelled down overnight from Port Macquarie and ate up this morning. adjourned pending the receipt of same. Takeover Target - what a champ - what a story. The ultimate feel good racing story. What a champ. Won Group 1s in 4 mainland capitals and a Group2 in WA. Won Group 1s in England, Japan and Singapore. Made 3 trips to Royal Ascot. 1 win, 2 2nds, 1 3rd and 2 4ths in his 6 races at Royal Ascot. I doubt we'll see anything like that again. Reckon the race that sticks in my mind the most was the one taken from him.